The Southern General Hospital (SGH) was a large teaching hospital with an acute operational bed complement of approximately 900 beds. 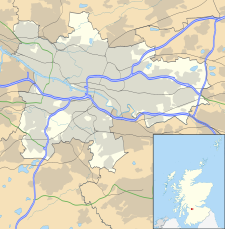 The hospital was located in Linthouse in the south west of Glasgow, Scotland. All facilities and services have been succeeded by the Queen Elizabeth University Hospital which was constructed on the site of the old hospital. The hospital had its origins in the Govan Combination Poorhouse located in old cavalry barracks at Eglinton Street in 1852. A new 240-bed hospital and 180-patient lunatic asylum were designed by James Thomson and completed in 1872. A major extension involving 700 more beds was completed in 1905. The hospital was formally renamed the Southern General Hospital in 1923 and it joined the National Health Service in 1948. Upgrading of the hospital’s facilities began during the 1950s and culminated in the opening of a new maternity unit in 1970 and the completion of the Institute of Neurological Sciences in 1972, where the Glasgow Coma Scale was devised by Graham Teasdale and Bryan Jennett in 1974. The Langlands Building, which provides care for the elderly, was procured under a Private Finance Initiative contract in 1999, was built by Carillion and opened in 2001. The laboratory, established to processes results from hospitals all around Scotland, cost £90 million and opened in 2012. All services were transferred to the Queen Elizabeth University Hospital in 2015. ^ a b c d "Glasgow". Historic Hospitals. Retrieved 31 December 2018. ^ a b "Govan". Workhouses. Retrieved 31 December 2018. ^ "Sir Graham Teasdale". University of Glasgow. Retrieved 26 March 2015. ^ "Glasgow Carillion wins Scots' millions". Construction News. 26 August 1999. Retrieved 31 December 2018. ^ "New £90m lab opens at Southern General Hospital". BBC News. 14 November 2012. Retrieved 12 February 2018. ^ "Inside Scotland's new £900million super-hospital - days before first patients arrive". dailyrecord.co.uk. Daily Record. 19 April 2015. Retrieved 9 November 2015. Wikimedia Commons has media related to Southern General Hospital.